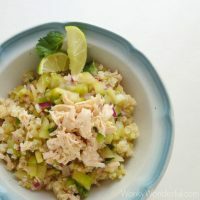 This Healthy Chicken and Salsa Verde Quinoa Bowl is gluten free and so unbelievably delicious that you will forget how nutritious it is! The poached chicken, tangy green tomato salsa verde and quinoa will leave you feeling satisfied. I’ve been on a health kick lately . . . Trying to ditch some of my bad eating habits and prepare more nutritious foods. So when I made some amazingly flavorful Green Tomato Salsa Verde I needed to find a way to enjoy it without tortilla chips. It was difficult, who wants to eat salsa without chips!?! Luckily I happened to have some cooked quinoa and poached chicken in my refrigerator. Light Bulb Moment! I thought a healthy chicken and salsa verde quinoa bowl actually sounded better than plain ol’ chips and salsa. I was not disappointed. Not only did it taste great but I felt fantastic after eating it! 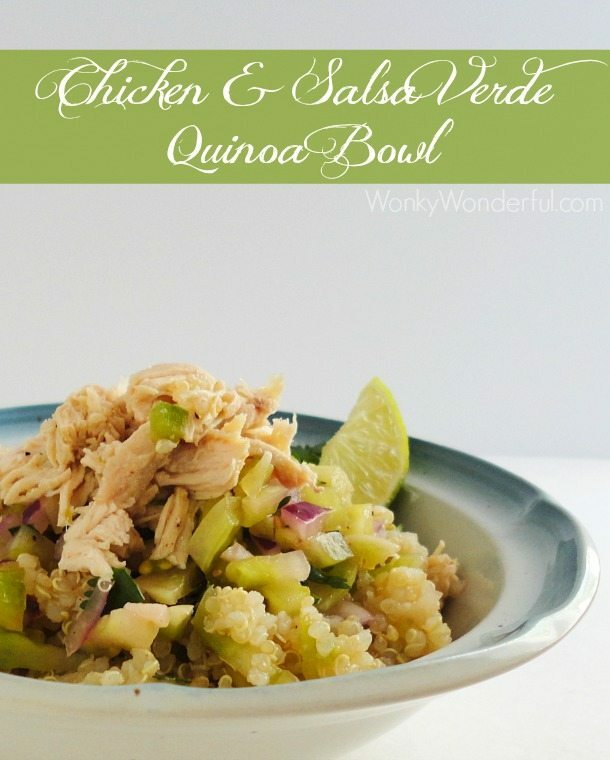 The healthy chicken and salsa verde quinoa bowl tastes fresh and vibrant. You are getting lean protein with the poached chicken breast and veggies from the green tomato salsa verde. Quinoa is a gluten free Super-Food that is high in protein but low in fat and calories. It also contains calcium, iron and potassium. 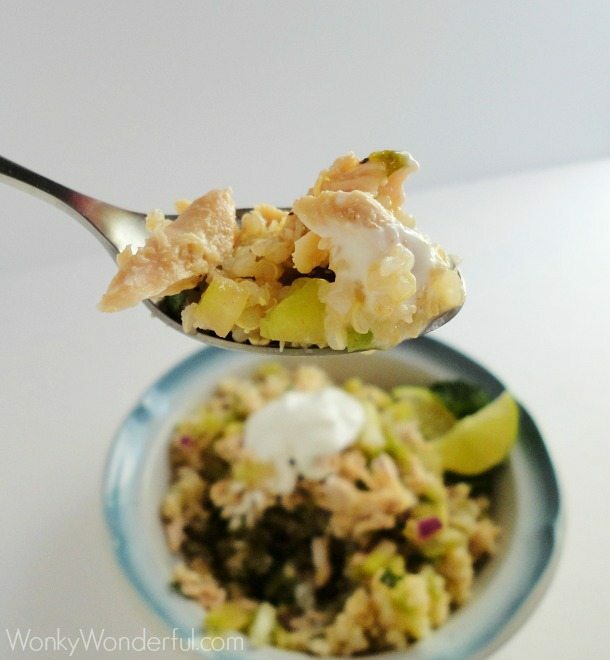 I topped my quinoa bowl with a dollop of plain Greek yogurt and a spritz of fresh lime. The only thing missing was some avocado. Unfortunately I didn’t have any avocados hanging out in my refrigerator that day. 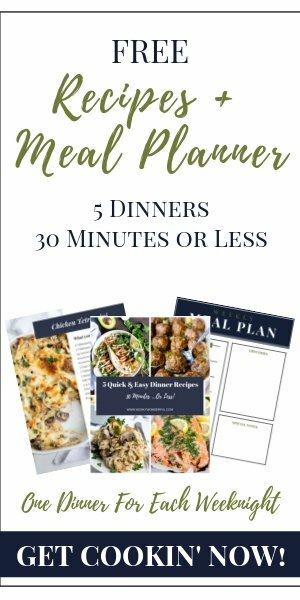 I’ve joined up with several other bloggers that are posting about their healthy lifestyle changes. This week’s focus is on exercise. Yeah, you may have noticed that I didn’t post anything about exercise. That is because I am the last person that should be giving out exercise tips . . . I Hate Exercising! Place chicken, water, oil and spices into small pot or sauté pan. Bring water to a boil then reduce heat to medium/low. Cover and simmer for 10-15 minutes or until chicken is fully cooked and opaque through the middle. Cooking time will depend on the thickness of the breasts. Assemble your quinoa bowl however you like and Dig In! That’s a great looking bowl of healthy right there! I’m trying to eat healthy. The hardest part is always making sure I have prepared ingredients so I can make a meal when I’m short on time. We should make up shirts that say I HATE RUNNING! I just can’t ever catch my breath. I still sit too much and I’ve got to change that. I’d wear that shirt! The older and heavier I get, the more it hurts to run. You are doing great though! Such a delicious and healthy looking meal, Nicole! I want a big bowl full for myself!